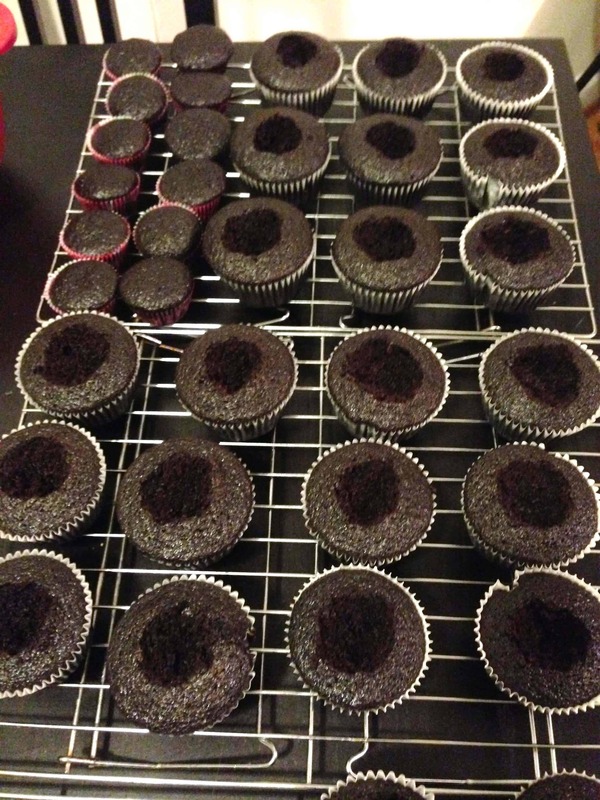 Preheat oven to 350 degrees F. Line a standard-size cupcake pan with liners. Place the chocolate and cocoa powder in a medium bowl. Pour the hot coffee over the mixture, and whisk together until smooth. Set the mixture in the fridge for 5 minutes to cool. Meanwhile, whisk together the flour, sugar, salt and baking soda in a medium bowl; set aside. Whisk the oil, eggs, vinegar, and vanilla extract into the cooled chocolate-coffee mixture until smooth. Gradually add the flour mixture, and whisk until smooth. Divide the batter evenly between the muffin pan cups, filling them about 2/3 full. 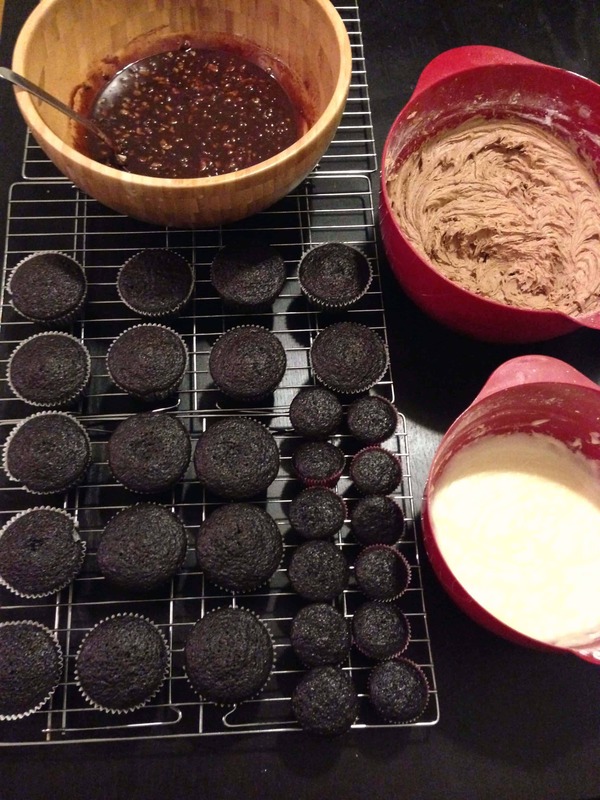 Bake until the cupcakes are set and just firm to the touch, 17 to 19 minutes. Cool the cupcakes in the pan on a wire rack for 10 minutes, then remove the cupcakes from the pan and place on the wire rack to cool completely, about 1 hour. While the cupcakes cool, make the candied hazelnut filling. Place the heavy cream in a sauce pan. Heat at a low hear, until the milk is warm to the touch. Add in the Nutella, and whisk until smooth. Gently fold in the candied hazelnuts. Refrigerate until just barely chilled (10 minutes). While the ganache cools, whip together the Nutella Buttercream. Cream the butter, until fluffy (about 2 minutes). Slowly add in the powdered sugar, and continue mixing until well blended. Add in the salt, vanilla, and half of the heavy cream. Reserve 1/4 of the frosting in a separate bowl, then add in the Nutella. Blend on low-speed, and add additional cream until you reach the desired consistency. Beat at high-speed until frosting is smooth and fluffy, about 3 minutes. When the cupcakes have cooled, hollow out the center of each cupcake (1 inch daimeter). 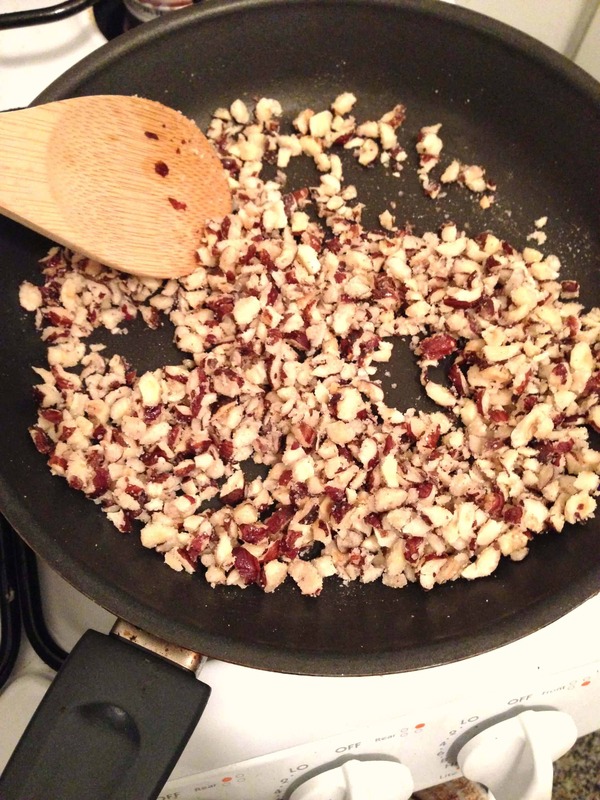 Fill with a tablespoon of the hazelnut filling. Pipe on the Nutella buttercream using a large round tip. 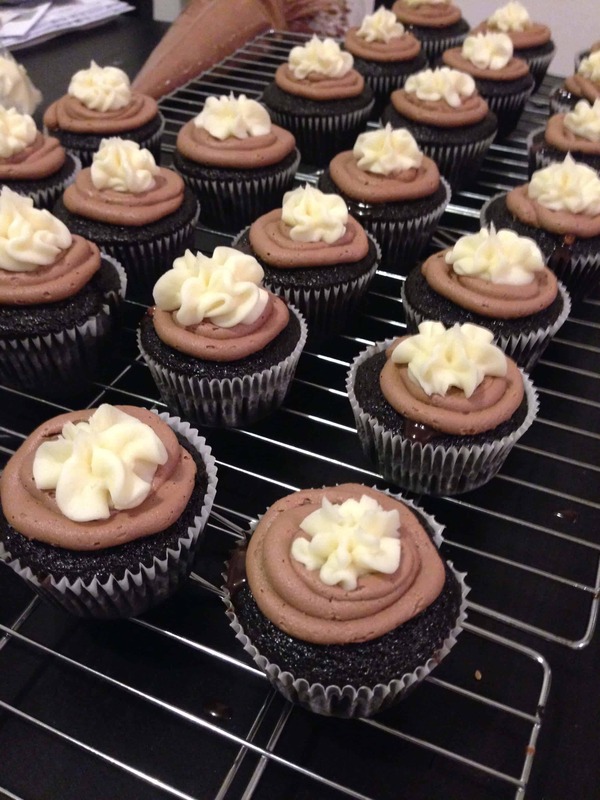 Using the reserved vanilla buttercream, pipe a swirl of frosting on top of the Nutella buttercream, using a star tip. If desired, drizzle warmed nutella over the frosting. 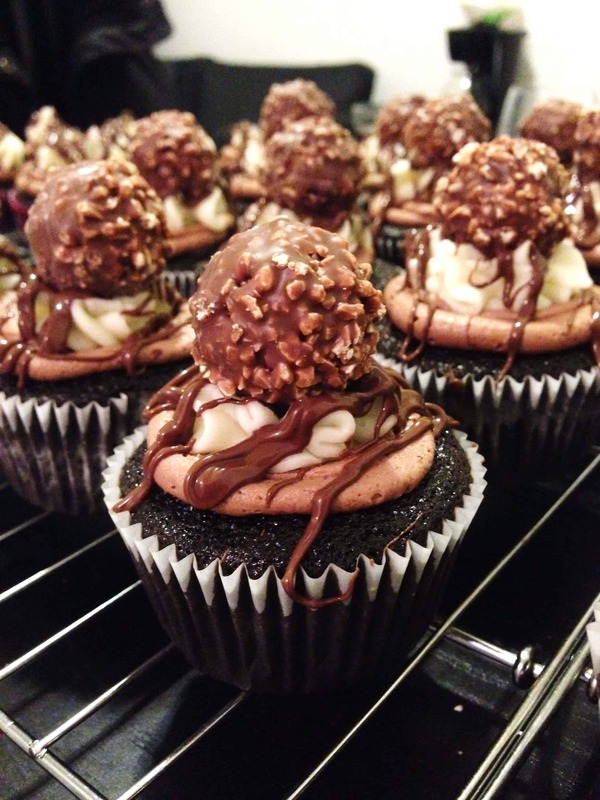 Top each cupcake with a truffle. And TAH DAH! More Nutella than you could dream of. was there a purpose to the mini cupcakes? I usually bring my treats into work, and my clients like the option of having a smaller treat! 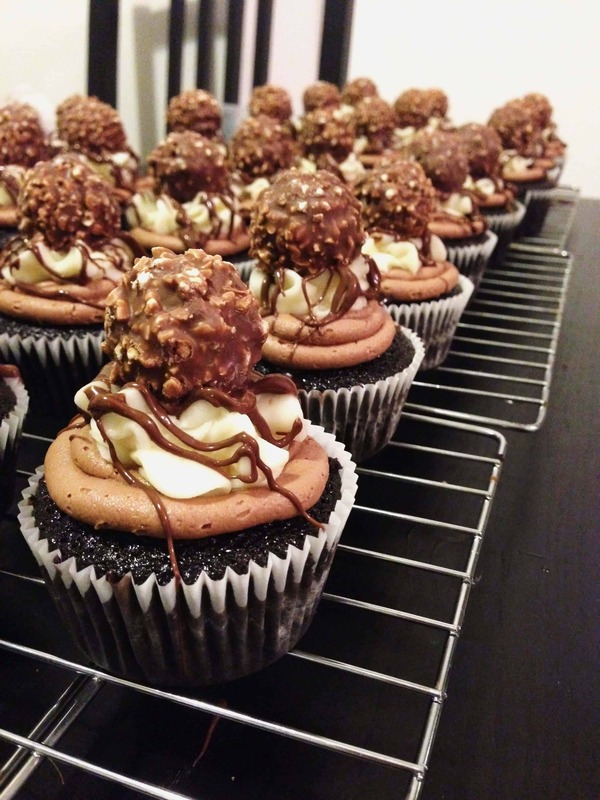 So I usually make a few mini cupcakes for people who don’t want to indulge in a big cupcake. I didn’t fill the mini cupcakes, or put a truffle on top, but they still tasted great!